Routines and kids. It’s an ongoing discussion among moms. Some take a hands-off approach and just let the day lead itself, others stick to a strict hour-by-hour schedule. In our family a routine has made all the difference. In fact, I believe routines are a major factor of a happy, peaceful home. Stick around to find out why! After dinner, my kids immediately begin cleaning off their plates and placing them in the sink. No ones has to utter one word; everyone knows what comes next. Even the the two youngest munchkins of the family get moving. They know what is expected of them, even though they can’t tell time. It’s the same routine every single night — dinner, clean off the table, wash dishes, baths, brush teeth, devotions and then bedtime. No one fusses about the arrangement because we have all been doing it for so long. If we change anything, we feel a little out of whack. Why do my kids know what is expected of them every single day? Don’t be scared by this word. It’s not exactly the same as a strict schedule — breathe a sigh of relief right there. Some mothers may frown at this word, since it brings structure into a child’s life. More moms are adopting the “hands-free” and “let children guide” style of parenting. They argue that the “hands-free” type of parenting offers the child more freedom and a chance to exercise creativity. They also would label me a “helicopter” parent because I am “hovering” over my child’s daily activities. Sometimes all the new parenting labels can get confusing! I thoroughly encourage creativity at our home. My kids get dirty, paint rocks, put on puppet shows and the list goes on. Our home is a happy, happening place, and there is hardly a dull moment. But, our home is not chaotic. There is still structure in our home that gives it a peaceful and calm atmosphere — amidst all the fun and learning experienced along the way. Here’s an example of our daily routine that the kids follow. It does change if we are home-schooling or on summer break. It also changes for trips, vacations and special occasions. That is where the flexibility of a routine comes in. Notice there are no times listed. That is simply because we are not slaves to the clock — except bedtime. We are pretty strict about getting to bed by 8 p.m.
We have certain time goals throughout the day. If we get an important phone call or visit, sometimes we have to start our routine 30 minutes or an hour later, but we still follow the same day-to-day pattern. Again, this routine is subject to change, but my husband and I try to keep the kids in an established routine so they feel confident and secure about their future. Confident? Did I say confident? Absolutely. When a parent sticks to a routine, a child or baby can be confident that they know what their future holds. They know that mommy will be there when they wake up from their naps. They know that there will be a hearty meal for dinner. And yes, they even know that their parents will be there to tuck them in and kiss them good night — every night. Do you feel more confident of your future when you stick to a routine? If you miss your morning run or coffee, do you feel like you have already began your day from a disadvantage? If you do, then you can totally relate to a baby or child that lives without a constant routine in his life. A parent’s job involves equipping your little ones for the best future possible, right? Consider this: the average adult’s life is full of routines. Most occupations require commitment to a number of predetermined working hours. If you mess up the routine too often, you may very well lose your job. How about routine dental check-ups or car maintenances? Machines, health and people work better on routines. Give your child a jump-start in preparation for real life, by beginning a routine today! 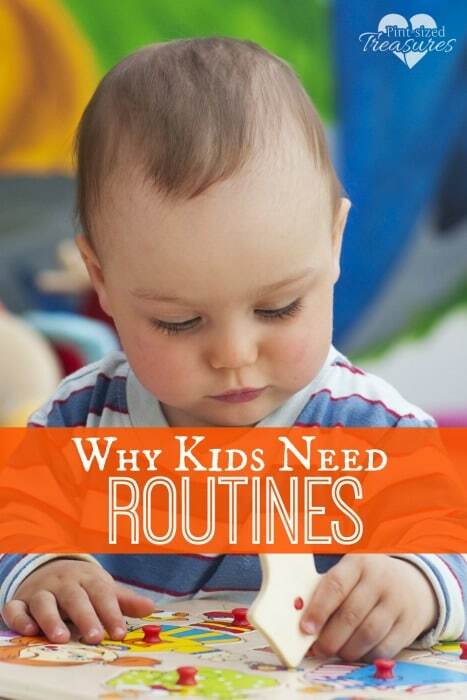 Routines also help parents divide their time between work and family. If you stick to a routine, you can schedule in special one-on-one time with your child daily, so you do not leave that important task undone. If you need an awesome, in-depth resource to help you understand and establish a routine for your child, check out this parenting resource that comes with loads of printables and concentrated help on this very topic! I’ve used it, loved it and know you will too! What is stopping you from establishing a routine in your home? Are one of these popular excuses yours? I’m afraid I will not stick to my routine. Have you ever cheated on a diet? Have you ever missed a workout session? Have you ever missed a yearly physical? Sure you have. Things come up or we simply have a less than diligent day. But what should you do? Just quit your diet and start shoveling donuts in your mouth at morph speed? No way! Your best bet is to get back on your routine with a renewed commitment. The same mindset applies to routines at home. I don’t want my baby to feel stressed about following a schedule.With each of my six kids I have used a routine. At first I did not want to schedule or do routine feedings and naps for my first child. However, he was cranky, fussy and became a discontent six month old baby. After listening to someone’s advice, I decided to try a schedule and a routine. I wrote it down on a piece of paper and taped it to the wall. Looking at my daily routine helped me stay on track. What was the end result of our family starting a routine? My life immediately became less stressful! My son became more content and took his naps easily since his body grew accustomed to napping at certain times. After lunch, his eyelids would begin to flutter and I would not even have to look at the clock to know it was 1 p.m. — nap-time. Shopping trips, get-together, play-dates and other fun activities became a lot less stressful as well. I just scheduled them around our routine, or started our routine earlier. I felt more in control and less of a mess. A calm and peaceful home does not just happen. It takes planning, hard work and diligence. If you desire a happier home that is less chaotic and more predictable, try establishing a routine. Keep in mind your husband’s schedule, church activities and other commitments. It’s best to create a routine that is friendly to other important events in your life. 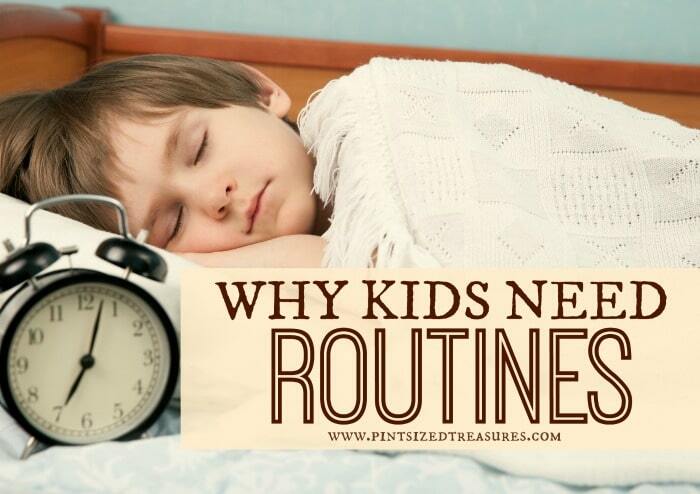 Does your family have a daily routine you follow? How has it affected the atmosphere of your home? Let us hear about it in the comments section! *Affiliate links have been added to help you add routines to your child’s life!